In building construction, furring refers to the backing surface used to support finished surfaces in a room. This involves the preparation of a wall, ceiling, or floor with strips of steel to provide a level foundation for plaster, flooring, or other surfaces. 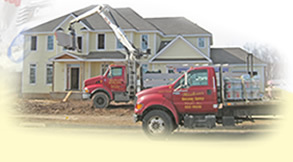 Westover Building Supply specializes in Steel Building Supplies. We offer quality furring services to Western Massachusetts, Northern Connecticut, Southern Vermont and Southern New Hampshire.